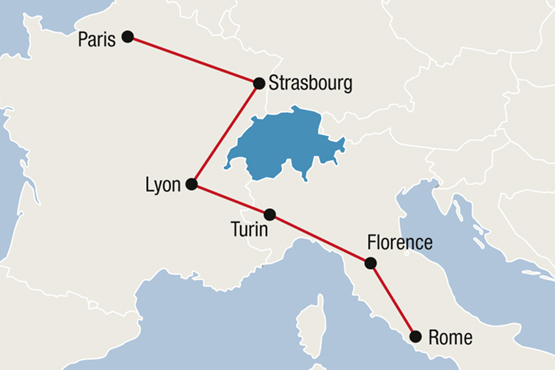 Experience Paris, Strasbourg, Lyon, Turin, Florence and Rome - «the Eternal City». Experience for 10 days 2 cultures and 2 of the most popular holiday countries in Europe. From Paris, the dream destination of all tourists, it takes less than 2 hours by high speed train to reach the charming Strasbourg with its cozy streets and half-timbered houses. In Lyon, culinary highlights and a beautiful old town await you before you cross the border to Italy. First stop is the shopping paradise Turin with the former royal palace. In Florence, unimaginable art treasures await you, before you can experience the more than 2000 years of history in Rome. Arrive in Paris by flight. Transfer to your hotel. Why not take a trip to charming Montmartre, home to artists and cabarets like the Moulin Rouge? Overnight in Paris. Depart Paris by high speed train to Strasbourg, famous for its picture-perfect old town and the cathedral. The district of Petit France with its half-timbered houses and the famous Alsatian cuisine spoil all the senses. Overnight in Strasbourg. Depart Strasburg by train to Lyon, the gourmet capital of France. Discover the old town with its traboules (secret passageways) and the more than 2'000-year history of the city. Be sure to visit one of the many bistros and enjoy local specialties. Overnight in Lyon. Train ride to Turin, the first stop in Italy. Visit the Palazzo Reale or the Duomo and enjoy shopping under the arcades. Italy has always been synonymous with good food! Turin is dedicated to chocolate and is the birthplace of the praline. During a walk in the city center you will find numerous small shops offering their homemade chocolates. Overnight in Turin. 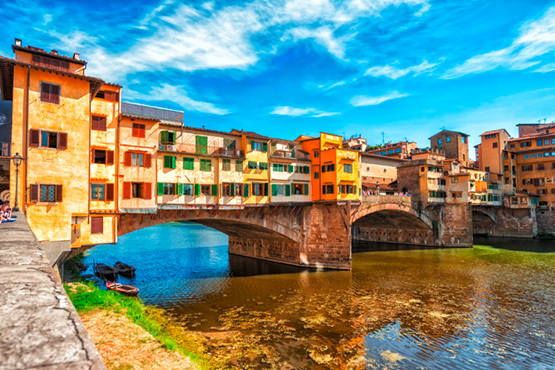 Train ride to Florence, the queen of the Italian cities - rich in art treasures and sights such as the Uffizi Gallery, the Duomo and of course the excellent cuisine and do not miss a visit to the oldest pharmacy in Europe. Overnight in Florence. Visit the famous market of San Lorenzo or stroll through one of the beautiful gardens of Florence. Where there is good food, there are usually good wines – as it is in Florence. Wine tasting options are available in the Florence area. Rent a bike, discover the area on two wheels and taste the best wines from vineyard to vineyard. Overnight in Florence. Train ride to Rome. Why not take a city tour in the afternoon to get an overview of this fascinating city? Rome is not only the capital of the state, but also home to the Vatican City in the middle of the city. This is where the spiritual leader of the Catholic Church, the Pope, lives and works. Speaking of God: You love ice cream? In the Gelateria Giolitti over 100 different varieties of ice cream await you - simply divine. Overnight in Rome. Explore «the Eternal City». In Rome, you cannot help but deal with the history of the city. Vatican, Roman Forum, the Trevi Fountain, everywhere the eyes are pampered with history and art. Speaking of pampering: Browse through the lively markets and enjoy an aperitif in Trastevere, the nightlife district of the locals. You will love it, promise! Overnight in Rome. Your unique journey to the most beautiful cities of France and Italy comes to an end. Transfer from your hotel to the airport in Rome. Lyon - Transfer from train station Part Dieu to your hotel or vice versa. Private taxi 1-4 persons. Paris - Transfer train station Gare de Lyon – hotel or vice versa. Private taxi 1-4 persons or minibus 4-8 persons. Rome - Private transfer from train station Termini – hotel or vice versa. Privat taxi (1-3 persons) or minibus (5-8 persons). Combine your trip to France and Italy with any Package in Switzerland, i.e.